Democratic senator Claire McCaskill, who is engaged in a fierce re-election battle in her home state of Missouri, is touting herself as a champion of men and women in uniform, despite her congressional record. Since joining the Senate in 2007, McCaskill has served on the Armed Services Committee, which has jurisdiction over Department of Defense funding and policies affecting U.S. military personnel. 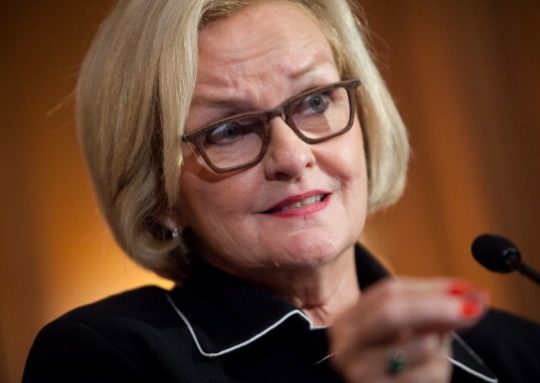 Even though the committee is recognized to be one of the most important in the Senate and certainly the most important to members of the military, McCaskill has missed nearly half of its hearings throughout her tenure in Congress. Documents obtained by the Washington Free Beacon indicate that between 2007 and September 2018, McCaskill skipped 235 out of 471 hearings held by the Armed Services Committee. The senator's absence likely resulted in missed opportunities to weigh in on strategic defense initiatives, military research and development projects, as well as pay and benefits for members of the armed forces. The senator racked up her largest number of absences during the 112th Congress, which took place between 2011 and 2012 when she was locked in a close re-election contest. During that time period, McCaskill only attended 23 out of a total of 66 hearings. McCaskill's absences on the committee far outpace those of her fellow red-state Democrats, including Sens. Joe Donnelly (Ind.) and Bill Nelson (Fla.). It is unclear why McCaskill missed the hearings or if her absences were excused. McCaskill's total number absences do not include hearings she missed while receiving treatment for breast cancer. The senator's campaign did not return requests for comment. Despite her tenure on the Armed Services Committee, McCaskill's campaign is touting her record on the military and veterans issues this election cycle. In one recent ad, McCaskill's campaign claims she's "moved mountains" for veterans. Apart from skipped committee hearings, the senator's legislative record offers few insights into her accomplishments on behalf of those who have served. Of the six bills that McCaskill has introduced that have become law since 2007, only one dealt with veterans issues. That legislation, which was signed into law by President Barack Obama in 2010, mandated that the secretary of the Army present occasional reports to Congress regarding the management of Arlington National Cemetery. McCaskill's most high-profile effort on behalf of members of the armed forces seems to be her failed attempt to combat how sexual assault cases are handled in the military. In 2014, McCaskill introduced legislation to streamline the process by which cases of sexual assault are handled in the armed services by giving victims the opportunity to have their cases adjudicated either in the military court system or the civilian justice system. The legislation, which drew rebuke from progressives for being too "watered down," underscored the inner divisions within the Senate Democratic conference that have likely hampered McCaskill's ability to represent the interests of her state and party. Earlier this year those divisions were on display when McCaskill sided with her party by voting against the confirmation of Gina Haspel, President Trump's choice to lead the Central Intelligence Agency. When pressed to elaborate on why she believed Haspel was unfit for the post, McCaskill claimed the reasons were classified. McCaskill's vote against Haspel resulted in a public rebuke from her Republican colleague, senator Tom Cotton of Arkansas, for placing "politics over national security." "McCaskill proved once again that she is so liberal, and so reflexively opposed to the president that she cannot represent Missourians in the Senate," Cotton said at the time. "She put partisan politics over national security." Retired Marine Corps colonel Jack Jackson told the Free Beacon that the senator's legislative record and her tenure of prolonged absence from the Armed Services Committee were troubling. "During election time she talks about veterans issues and the military," Jackson said. "Yet when the elections are over, she doesn't show up when it matters to voice the concerns of Missouri's active duty members and veterans." Jackson, who serves as a member of the veterans advisory council for McCaskill's Republican challenger, Missouri attorney general Josh Hawley, added that it was "easy to see" how McCaskill's actions in Congress diverged from her rhetoric on the campaign trail. "It's hard to take some of these ads and statements seriously," he said. "She supported the Iran Deal, supported defense cuts … knowing they would hurt military families [in] Missouri. You can't be for all of that and simultaneously be for our military and our veterans." Update 2:12 pm: An earlier version of this article incorrectly stated that McCaskill voted for the 2018 government shutdown. McCaskill, in fact, was one of five Democrats to vote against the shutdown. This entry was posted in Politics and tagged 2018 Election, Armed Services Committee, Claire McCaskill, Josh Hawley, Missouri, Senate, Senate Democrats, Veterans. Bookmark the permalink.